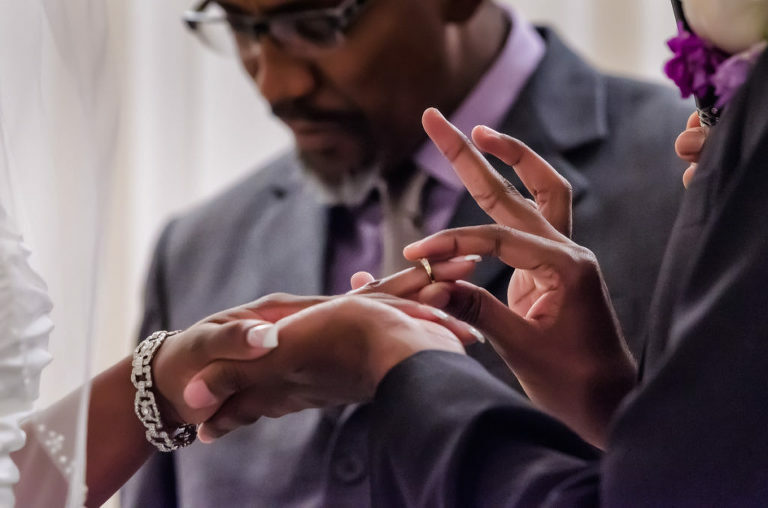 While it may seem trivial, some simple coaching on the proper way to hold the rings and each other’s hands can mean the difference between getting a clear view of the ring exchange and disappointment. The ring donor should take and hold the recipient’s ring-bearing hand (left hand) palm down in the palm of their right hand which is facing upward (just remember, palm to palm). The ring donor should then hold the top and bottom of the ring between the thumb and index finger of their left hand and slowly slide it on the ring finger of their partner. In this way, the photographer and guests have a clear, unobstructed view of the rings from the side as they are placed on the ring fingers. Holding the rings the wrong way covers up and obscures the view completely. In addition, a small pause while placing the rings on each other’s fingers, perhaps accompanied by a few tender words for your partner, ensures that the photographer will have ample opportunity to capture this pivotal moment of the wedding ceremony.